Someone Will Win Return to Nim's Island Blu-ray Combo Pack! Shutterfly Valentine's Cards & Photo Plaque! Are you thinking about a new home loan or refinance in Pennsylvania or New Jersey? Ron Leraris, of GMH Mortgage, will work with you to achieve your home financial goals. Ron is a long-time friend of mine, a professional Mortgage Banker, and I was pleasantly surprised when he could refinance my mortgage for a lot less than my own bank had quoted. We saved a ton of money refinancing with Ron, and the entire process was very smooth! Are you a PA or NJ resident? If so, please enter to win a $50 Target Gift Card from my friend, Ron Leraris, of GMH Mortgage Services, LLC. Promotion for PA and NJ residents only. Please see the full promotion rules, terms and conditions in the Rafflecopter widget above. Win a Milk Unleashed variety pack consisting of four shelf safe milks (white and chocolate) from: Hershey’s, LaLa, Horizon and Organic Valley! Plus the variety pack will have a cow stress ball and information on shelf safe milk! I'm the type of person who always likes to try new things. There are new products popping up and I get so excited when I find a cool product that I never knew about before. 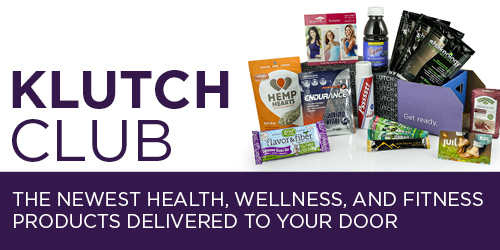 Klutch Club is a way to try out new health, wellness & fitness products so that you can keep on top of the trends. Here's how it works: Sign up for a membership - choose 1 month, 3 months, or 1 year for as little as $16.00 a month. Then, your box is shipped right to your door! Oh so yummy Fruit and Seed mix from Enjoy Life Foods. Warner Bros. is proud to announce the release of Journey 2: The Mysterious Island on DVD and Blu-Ray! In this movie, Sean Anderson (Josh Hutcherson, The Hunger Games) finds a hidden signal that he believes will lead him to his long lost grandfather (Michael Caine, Miss Congeniality). With the help of his new step father (Dwayne “The Rock” Johnson, The Scorpion King), Sean finds a map and starts his adventure which leads him to Kailani (Vanessa Hudgens, High School Musical) and the island of Atlantis! Sean and his friends battle giant bees, killer lizards, a volcano of gold, and electric eels to escape the lost city and make their way home! Want to check out the movie for yourself? One of my lucky readers will win a Journey 2: The Mysterious Island on DVD. Enter by using the Rafflecopter Widget below. Nancy Vecchione won the tickets to Monster Jam. Stacey Dunning won the T-Fal Actifry. Kelly A. Moran won the Beyond Coastal Prize Pack. It's impossible to keep my kids out of the sun. It's baseball season, which means we spend a lot of time outside together throwing the ball back and forth and practicing their swings. We've been lucky to have some fantastic weather while we juggle so many outdoor activities. Soon, it will be beach and pool season which means we will be lathering on the sunblock non-stop. I think my kids would be outside from sunrise until sunset if they had the chance. That means I need to have plenty of suncreen with ingredients I trust. Last year, my husband and I started taking notice of the ingredients in our sunscreen, and this year we're even more serious about the sunscreen that we're putting on ourselves and our children's skin. I'm not a doctor or scientist - just mom trying to protect my children. Right now, Oxybenzone is the #1 ingredient that we avoid in sunscreen so I when I received some Beyond Coastal sunscreen to try out, I was thrilled to see they were all Oxybenzone FREE. If you're not familiar with this common sunscreen ingredient, you might want to read The Seattle Times article Do Your Part: Pick a safer sunscreen and this article from the Environmental Working Group. Ultimately, we've decided to try and steer clear of oxybenzone. I don't know if it will really make a difference in my children's health, but at least I'll feel like I'm doing my best to keep their skin safe. We tried the Kids SPF 30+ Natural Sunscreen by Beyond Coastal and it worked great. I've found that many sunscreens with Titanium Dioxide and Zinc Oxide tend to leave a slight white residue on the skin at first. This one did as well, however, it didn't bother me at all. At least I feel safe with what's on my kid's skin. The Active Face stick has become a favorite in our house. I'm embarrassed to admit that there have been many times where my husband and I have had to chase our boys around the house in order to get sunscreen on them. I don't know what it is, but no matter how many times we've put sunscreen on them, they can still give us a hard time about it. They much prefer to do it themselves and they really like the stick applicators. (Now if only they would actually apply the sunscreen to more than half their body, we'd be good!) Unlike the Titanium Dioxide and Zinc Oxide cream, the stick glides on very smooth and is perfectly clear. I have a feeling we'll be buying another face stick soon. Their Natural formulas are top rated by the Environmental Working Group and they're packed with natural anti-oxidants and contain no harsh chemicals. So, do you want to try Beyond Coastal Sunscreen for yourself? Enter with the Rafflecopter widget below. Use the Rafflecopter Widget to enter to WIN a family four pack of tickets to Monster Jam in Philadelphia on June 9th at Lincoln Financial Field. I've come to the conclusion that a girl can never have too many business cards. Just like having different shoes to match different outfits, it's nice to have different business cards to meet different needs. That is why I am very excited to give away a set of business cards to one of my readers. If you're in need of new business cards, check out PrintRunner's online business card printing and their online printing services. *Giveaway is open to US Residents only, ages 18 years old and above. A winner is allowed to win only once over a two-month period. Follow PrintRunner on Twitter and Like them on Facebook. Thank you to PrintRunner for providing us this giveaway, I will receive a set of business cards as a thank you for hosting this sweepstakes. This is one of the most exciting sweepstakes I've hosted in a while! One of my lucky readers will win the T-Fal Actifry by entering through the Rafflecopter widget below. I hope you already read my review of the Actifry and saw those yummy Sweet Potato Fries that I made. Here's a quick little video about the Actifry. Thank you to Denise from The Painted Home for offering to send one of my lucky readers a bouquet of paper flowers that she has made. If you win, you can keep them for yourself or send them to a friend to brighten their day. Enter by using the Rafflecopter widger below. Also, Denise has been busy making handmade paper flower bouquets and will be selling them on her site. Small bouquets are $18 and large $26. She will ship them anywhere in the US for just $9. Check out The Painted Home for more details. *The Bouquets that are shown in this post are not the exact color/size/shape that the winner will receive. Each bouquet is handmade and will vary in color/size/shape. Every bouquet is one of a kind! Win the New Year's Eve DVD! Yes, it's April and I'm talking about New Year's Eve. But, there's a very good reason! On May 1st, Warner Bros. Pictures is releasing their hit romantic comedy New Year’s Eve on DVD and Blu Ray. Do you remember when I posted about my New Year's Resolutions? My goals were to 1) Get more organized, 2) Exercise more and weigh less, 3) Spend less time on the computer 4) Give back and 5) Work on my "Parent Talk." I still have a lot of work to do, but I'm definitely committed to seeing these resolutions through until the end of the year. How about you? If you make a resolution, how is it going? No matter what... I have a treat for you. One of my readers is going to win a DVD of the New Year's Eve! I haven't seen this movie yet, but I can't wait to see it because I love romantic comedies. Scroll down to see the Rafflecopter form that you'll use to enter to win. So many moms I know have recently started their own businesses and they're really an inspiration. It's so cool to see more and more women taking the bull by the horns and making their own opportunities. Even though a good amount of advertising and networking is done online, it's also extremely important to have nice quality business cards too. Don't make the same mistake I did when I ordered my first set of business cards. Be sure to get a simple easy to read font on a heavy card stock. Uprinting.com offers top quality business card printing and so many great options. I can't wait to get my new die cut business cards from them so I can ditch my old cards! Over the Moon Sip Cups! When I watched the video below, I started to tear up. Just this past weekend, I was talking with a friend who is 7 months pregnant and she is anxiously awaiting the return of her husband who is serving abroad. Just like her husband, there are so many service men and women who leave their precious families to protect our country. No matter how strong they are, it's not easy. Did you or someone you love serve in the military? The Art of Marriage Ops event aims to help our men and women in the military by strengthening their marriages. But, it’s not just military men and women who could use a little extra help. Check out the widget below for five great inspirational date ideas that will help bring you closer to your partner and other ideas to help spread the word about this project! Then, scroll down to enter to win a $20 Applebees Gift Card thanks to The Art of Marriage.